The Czech Republic is a landlocked country in Europe. The country's cuisine has been very much influenced by that of its neighbors, but also has its own distinctive elements and dishes too. Czech cuisine tends to emphasize meat dishes, especially pork, but also beef and chicken, and sometimes duck, goose, rabbit or wild game. For the most part, probably because the country has no coastline, fish dishes are rare - the exception being freshwater fish such as trout or carp, the latter of which is usually eaten Christmas. Bramboráky (also known as "cmunda", "vošouch", "strik" or "striky") - Fried pancakes made out of grated potato. Knedliky - Knedliky are dumplings made from potato, or wheat flour and stale bread. They are cooked by boiling, then sliced before eating. They are generally eaten as a side dish with other foods. Smazený sýr - A thick of slice cheese that is coated with bread crumbs and then deep fried. The dish is usually eaten with tatarská omácka, which is the Czech version of Tartar sauce. Svícková na smetane - Roast beef served with dumplings. It is covered with a thick sauce containing cream, carrots and parlsey, and usually served with a spoon of cranberry compote and a slice of lemon. Utopenci - Pickled bratwurst sausages. Veprová pecene s knedlíky a se zelím ("Vepro-knedlo-zelo" for short) - Roast pork with dumplings, and fresh cabbage or sauerkraut. In Bohemia, sauerkraut is generally used, whereas in Moravia either fresh cabbage or sauerkraut with sugar is used. Ovocné knedlíky - Fruit dumplings. They are made by coating pieces of fruit with potato dough and then boiling. Many different fruits can be used to prepare the dish, and it can be eaten as a main dish or a dessert. At Christmas and Easter, plum dumplings are particularly popular. Qaghaq ta' l-Ghasel - This Maltese recipe is a light pastry ring made with honey or treacle. It was originally only eaten at Christmas, but nowadays tends to be eaten all yexar round. 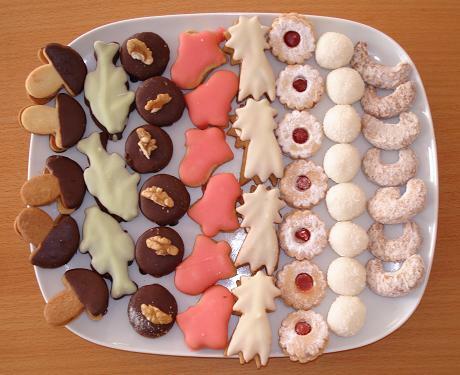 Vánocní cukroví - A type of decorated cookies that are eaten during the Christmas period. Vánocka - This is a cake that is popular during the Christmas period. 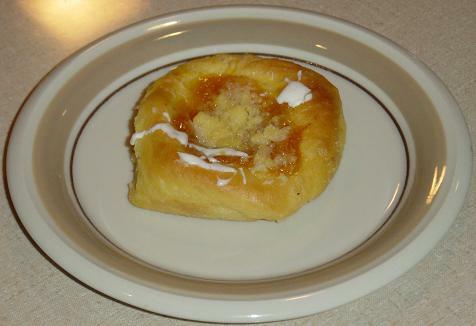 It is made with eggs and butter, and contains raisins and almonds. Lemon rind and nutmeg is also used to flavor the dough. The cake is traditionally made by preparing braids of the dough, and then stacking them, and then cooking it. The Czech Republic and Slovakia are noted for their hearty, wholesome meals. The food staples are provided principally by farmland, and include milk, cheese, livestock, wheat, fruit and root vegetables. Featuring over 340 photographs which show both practical steps and beautiful final dishes, along with complete nutritional information for every recipe. This is an evocative and inspiring guide to a heart-warming and traditional way of cooking. While similar to the cuisines of Russia, Hungary and Poland, Czech cooking is uniquely appealing, practical and elegant. This edition includes 240 easy-to-prepare recipes, featuring a variety of meat dishes, delicious soups, salads, dumplings, and desserts. This expanded edition now provides a concise guide to Czech aperitifs, wine, and beer. A collection of over 100 Czech recipes, many that are from my Babi, (Grandmother) Alma Benesh, and have been passed down from generation to generation. 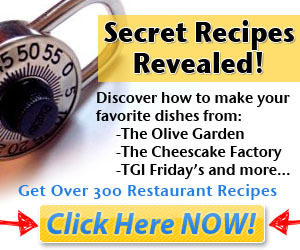 I have also included over 40 recipes that are family favorites. The history of the Kolach and the history of poppy seed add to this informative cookbook. I hope you enjoy our Czech family culinary traditions! Are You fascinated by The Czech Republic? Have Czech Heritage? Want to eat REAL Czech Food that is Delicious and Traditional? With the help of my Babicka (grandma) who at 82 has been cooking since the early days of the Soviet Union we formulated a real Czech Recipe book. This book is unique in that it has REAL traditional Czech Recipes that have been in my family for generations! I also made sure to include popular regional dishes that are unique to certain areas of the Czech Republic. There’s a little bit of everything here from Czech Dumplings to the infamous Palacinky. Pick your own delicious Czech adventure with our 50 recipes! If you are ready to eat delicious Czech Recipes Today... Don’t waste any more time buy this books now! Czech cuisine is one of the most tastiest cuisines all around the world. It combines the best of east and west under one roof. Inside of this book you find over 50 recipes with large images to assure you how to serve the food properly. All recipes use European metric system. Don't worry, unit conversion chart is included. This inexpensive, index card size spiral-bound recipe book features over 100 Czech-American recipes. Makes a great gift or "stocking stuffer" for friends and relatives.